Detail from the diagram of Wernher von Braun’s conjectural Moon ship published in the Collier’s Magazine issue of October 18, 1952. Click for a larger, complete view of the whole diagram. Wernher von Braun, Willy Ley, Fred Whipple, and others famously jump-started American interest in space with their series Man Will Conquer Space Soon!, published over eight different issues of Collier’s Magazine between March 1952 and April 1954. This is from the second one, October 18, 1952’s “Man on the Moon”. Though unsigned, it is likely the work of magazine artist Rolf Klep—Chesley Bonestell is remembered for the paintings he did for the series, but Klep did most of the more diagrammatic images. It depicts two variants of the same basic ship, one a passenger ship and one a cargo ship. Both would have been built in orbit after a space infrastructure of orbital rockets and a space station had been put in place. Two of the “passenger” version would have carried a total of 50 scientists and technicians between them, while the “cargo” version would have been on a one-way trip to the Moon carrying the supplies the 50 men (and the title of the series leaves little doubt that it would have been only men) would need for a six-week stay on Earth’s nearest neighbour. Their goal would have been the Sinus Roris near the Moon’s North Pole—and later used by Arthur C. Clarke as the setting of his A Fall of Moondust, in all likelihood because of its mention in this article. The ships are 160 feet tall, which is to say just about the same height as the entire Space Shuttle stack. They were to have burned nitric acid and hydrazine, which was quite prescient on the part of Dr. von Braun as that’s one of the three most popular rocket fuel combinations (along with LOX/LH2 and LOX/Kerosene) down to the modern day. Less prescient is its mercury-vapour powered turbine, which uses the parabolically concentrated light from the Sun to evaporate liquid mercury and generate 35 kilowatts. They were the hot new thing in 1952, but fell out of favour not long after. So far as I know there’s never been one in space. Naturally on arriving at the Moon, the astronauts would set about building a Moon base using the cargo they brought as well as the one ship that brought it. From there von Braun confidently predicted that it would not be too much longer before the first manned trip to Mars ensued. While this ship was never a serious proposal like all the other posts to this blog have been, it’s historically significant. 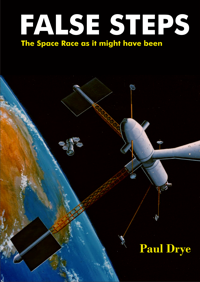 Though published in 1952 it originally dates back to a non-fiction book written by von Braun in 1948, Das Marsprojekt. Bearing in mind that this is only three years after he was forced to leave Germany, it likely reflects his long-term goals for the German V-rocket program. As is well-known, he was highly interested in diverting it from focusing solely on weaponry into space exploration—indeed the winged rocket ships used to get von Braun shipwrights into orbit to builld these Moon ships look like a hybrid of the most speculative and advanced idea Peenemünde floated, the A12 and the winged A6. Who knows? In a different, more peaceful world we may have seen Germany sending something like this to the Moon in 1980, dedicated to the memory of the recently deceased father of the German space program. A “conceptual view” of the Minimal Orbital Station. Based on the mockup of the initial two-module station (linked below), the actual MOS would have looked somewhat different, but one module would be for human habitation and the rest would be gas tanks for fuelling the Moon ship and its injection stage, top. Another tanker is approaching, as it would take four fuellings in total to top up for a journey to the Moon. Image from Project Horizon: Volume I. Click for a larger view. What it was: Project Horizon was the US Army’s full-blown proposal to put a man on the moon (and, in fact, start up a whole lunar base) by the end of 1966. While much of its focus was on the base itself, it also included extensive discussion of both the Earth-bound and orbital infrastructure they felt was necessary to reach their goal. 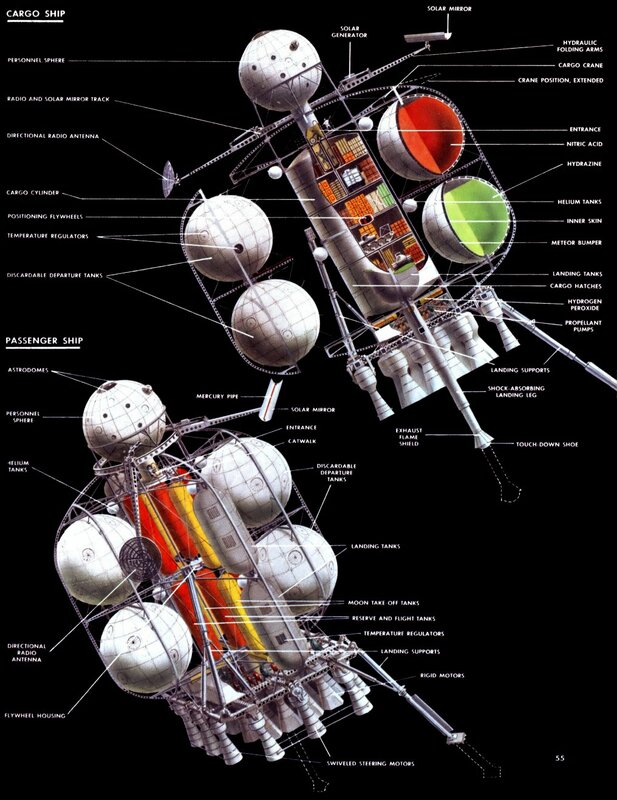 The Minimal Orbital Station (MOS) was essentially a gas station in LEO for ships headed to the Moon, while the Orbital Return Vehicle was to be used to bring the gas station’s attendants back down to Earth when their tour of duty was done. Details: In Project Horizon, Part I we discussed the US Army’s proposed launch facility on Christmas Island in the Pacific. Had it gone ahead, American soldiers and civilian experts would have been loaded on Saturn I rockets (or possibly a “Saturn II”, an early design of what would lead to the Saturn V) and launched into orbit. Where would they go? To the space station, of course. The Project Horizon proposal blandly asserts “It is very likely that a previously constructed completely equipped space platform will be available in 1965 for use as housing facilities and for other support for the refueling operation.” It does then admit that it’s at least possible that 1965’s near-inevitable space station might not be suitable as a base for the Moon mission (by, for example, being in the wrong orbit). On the off chance that this happened, they proposed the Minimum Orbital Station. A view of the MOS mockup shown in 1960. The bottom module is a Saturn stage converted for habitation. The cone at top is the ORV. Public domain image from NASA. Click for a larger view. Building the station would start with a launch of a Saturn I with a payload of men in the nosecone. Once in a 640 kilometer equatorial orbit (a height selected so that the station would circle the Earth in an even fraction of a 24-hour period, making it easier to return to the launch point after the mission was over) the nosecone and the upper stage of the rocket would both reach orbit, at which point the two would disengage. 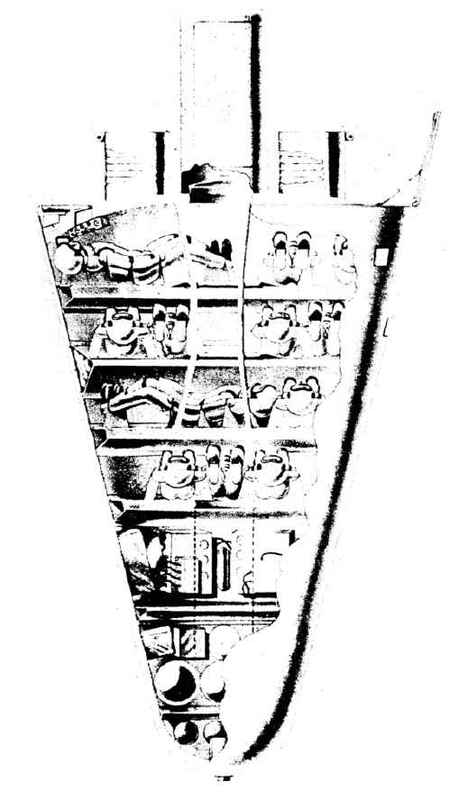 The upper stage’s remaining propellant would be blown out, and the aft end of the nose cone would be mated to the top of the stage—or possibly the side if this variety of Saturn I was redesigned to have an airlock there. The astronauts could then enter the empty stage and fit it out as a living and working space; this “wet workshop” concept would appear again in the designs of the Manned Orbiting Laboratory and the original Skylab. This basic MOS was enough to house the astronauts, but not to support a Moon mission. Project Horizon assumed that the lunar landing would be a direct descent, which implies a considerably heavier load of fuel than was needed for the Lunar Orbit Rendezvous approach that NASA came to favour in the years following the Army proposal. The Saturn I was completely incapable of lifting both a direct-descent landing craft and the necessary fuel at the same time, so the two had to go up separately. Once the MOS had one empty stage housing its crew, another Saturn I would be sent up, only this time it was carrying a full load of fuel instead of men. 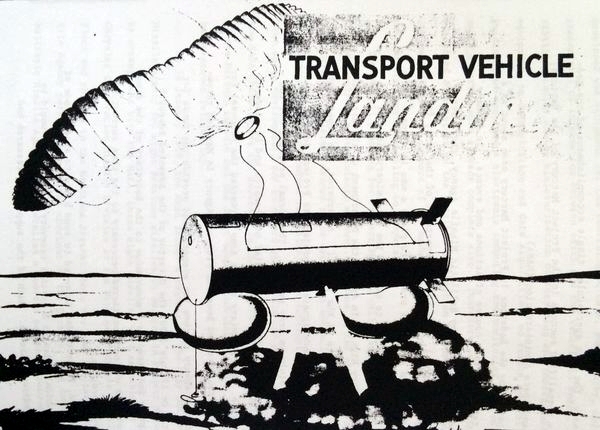 The fuel-laden tank would attach itself to the side of MOS, and then the process would repeat: the baseline lunar landing mission in the proposal suggested four tanker launches would be needed before enough fuel was in orbit. More missions might be sent up carrying men, depending on how many orbital personnel were deemed necessary for the next step: getting the lunar craft fuelled and underway. One final Saturn I launch would loft an unfuelled direct descent ship (that’s six launches now, if you’re keeping count), which would rendezvous with the MOS. The station’s crew would get into their spacesuits, spacewalk out into LEO, and transfer the fuel from one to the other. Three crew would then get aboard the lander and head off to the Moon. The remainder would either re-board the station for the next mission (the pace of Project Horizon’s launches, as discussed in Part I, was downright frantic), or head back to Earth. Those headed back to Earth would use the Orbital Return Vehicle. This is where the word “minimal” really comes into play, as it was essentially just a conical capsule roughly 7 meters long and 4 meters at its base. After detaching from the MOS, a small retrorocket would knock it out of orbit and its crew would ride down to the ground. 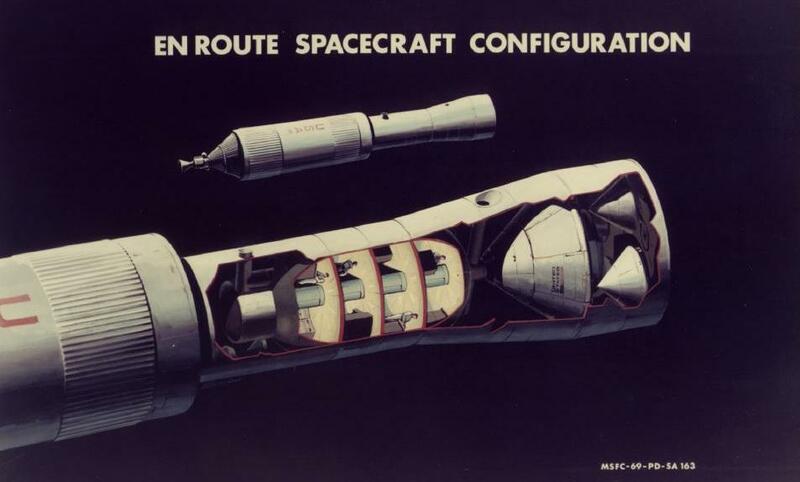 Astonishingly, the Project Horizon report suggests that it would have carried anywhere from 10 to 16 men at a time—bear in mind that the actual Gemini capsule gave its two astronauts 5.7 x 3.05 meters to play with, and no-one ever described the Gemini as “roomy”. This feat was accomplished by dividing the interior into no less than three decks (four, if you count the equipment compartment in the nose). There would be no room for sitting or standing here, so the astronauts would lie prone for the entire trip. Here’s hoping they didn’t miss their initial de-orbit burn time and have to wait 90 minutes for the next. An unfortunately blurry diagram of the ORV from Project Horizon: Volume II. Notice the number of astronauts depicted. Click for a larger view. Ultimately, the plan was to turn the MOS into a destination in its own right, chaining together more and more Saturn stages converted for habitation and then eventually curving the chain back on itself to form a ring station that could be spun for artificial gravity. What happened to make it fail: As mentioned in Part I, Project Horizon fell afoul of Eisenhower’s dislike of military activity in space. He’d already tried to pry manned space programs away from the Army, Air Force, and Navy by forming ARPA in February 1958. When that failed (ARPA then famously moving on to other projects like the development of the primitive Internet), he tried again and got them transferred to NASA. In the particular case of the Horizon space station part of the larger Project Horizon. The Army’s main interest was militarizing the Moon, and the station was just a step toward that was made necessary by an EOR mission profile. When Eisenhower specifically took space exploration missions away from the services and gave them to NASA, the Army Moon program was dead and an Army space station to support it became superfluous. What was necessary for it to succeed: The station was only going to go ahead if the Army had been given the green light on all of Project Horizon. Something like it might have been built if NASA had decided to use an EOR strategy for the Apollo program, but even that isn’t certain. 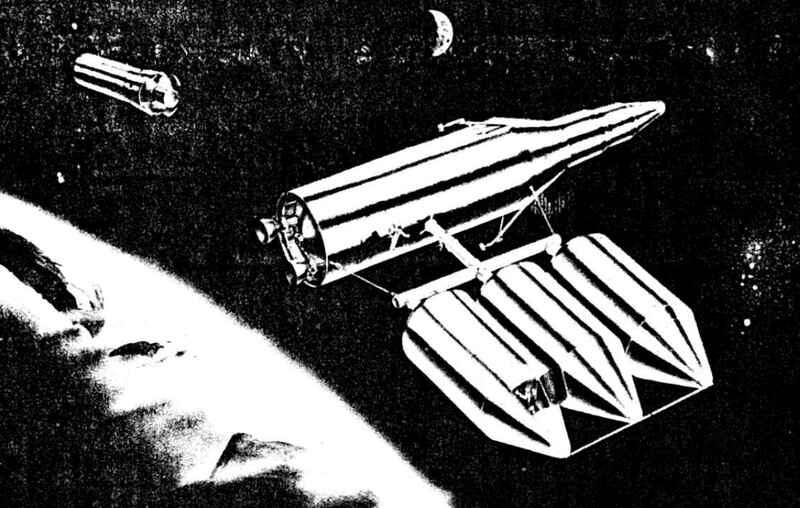 The USSR considered a similar approach and felt that they didn’t need a station: their Moon ship would have fuelled up directly from the tanker rockets. When NASA decided to go with a Lunar Orbit Rendezvous lunar landing in July 1962, the chances of seeing something like the MOS dropped from “maybe” to “none”. Space stations would be built in future, from Salyut to Skylab to Mir and the ISS, but none of them would serve the peculiar function of the MOS. Any similarity between them and the Horizon station was a function of position only, and not purpose. As it was, the MOS and ORV made it to the mockup phase and no further; a diagram of one of these mockups can be found further up this page. Oddly enough it was put on display at the Daily Mail‘s 1960 Ideal Home Show in London, of all places. Somewhere between 150,000 and 200,000 visitors passed through it, and by all accounts it was one of the hits of the show. A cutaway view of the Planetary Mission Module (centre) and Mars Expedition Module (right) on top of the Nuclear Shuttle (fully visible on the second ship in the background). Public domain image from the Marshall Space Flight Center, NASA. Click for a larger view. What it was: NASA’s follow-up to the Apollo program. A manned mission to Mars would have been launched in November 1981, brought twelve men to Mars—six of them landing—and then returned to Earth in August of 1983 (with a flyby of Venus along the return route). There would be two more manned missions by the end of 1985, and a manned base by the middle of 1987. NASA had been answering it intermittently for years prior to this but now they got down to business. In particular, while they supported the Apollo Applications Project they were not content to stick to those missions’ main goal: to find out new things to do with the hardware they had already developed. Quite reasonably they decided that they needed to carry onwards and upwards with their engineering. Not only was a manned mission to Mars the obvious next step from an exploratory standpoint, it had the advantage of requiring that they move beyond Apollo equipment. To that end they turned once again to Wernher von Braun. This was the culmination of his life dream: he’d published a Mars program in 1948, made a splash with the variant of it published in Collier’s in 1954, come up with another smaller expedition in 1956, and then sponsored the so-called EMPIRE and UMPIRE studies in 1962-64. On August 4, 1969 he made a presentation of what would be his final Mars proposal to the Space Task Group (STG), chaired by Vice President Spiro Agnew. The mission was to be the penultimate part of a two-decade effort, the Integrated Program Plan, which could really be thought of as “Apollo 2.0”: another vast effort with an end goal, designed to replace the one that had just finished. As such it was part of an integrated whole that developed orbital operations into a finely tuned science, first by practicing with the Apollo Applications Program space stations and lunar base. One of the tools was to be a new space-only booster based on NERVA—which is to say, the first ever nuclear thermal rocket. This piece of equipment, dubbed the Nuclear Shuttle, was intermediate in mass between the second and third stages of a Saturn V, and had a higher specific impulse than any rocket ever flown. Individual Nuclear Shuttles would be fueled in orbit with liquid hydrogen and used to push men and cargo to the Moon, then the empties returned to Earth orbit when they could be refueled and used again—up to ten times in all. Regular Saturn V launches would occur all through the early to mid-70s, building a space station and generally preparing the necessary infrastructure to be a “gas station”. Meanwhile the other necessary equipment would be tested as part of an Apollo Moon base (basically a revival of the ALSS Lunar Base, which had been cancelled when new Saturn V production went into hiatus). There would be tests of the Nuclear Shuttle by the end of 1977, and 25 men living on the Moon by 1982. With all that shaken out, the Mars mission would begin on November 12, 1981 with two ships launched on a Mars-bound a trajectory from low-Earth orbit. Each would consist of three Nuclear Shuttles strapped in tandem and a Mars craft made up of a Planetary Mission Module (PMM) habitation section and a Mars Excursion Module (MEM) lander mated to the tip of the one in the centre. The two side Shuttles would get the centre one and its payload up to speed, then peel loose and re-enter Earth orbit for reuse, while the two diminished mission craft would carry on their way. There were two because the mission had the unique profile of backing itself up. Strictly speaking only one would be necessary for the mission, but the second would fly in formation to be a lifeboat in the case something went horribly wrong on the first—and the first served the same purpose for the second. This kind of redundancy was necessary because the mission’s twelve crew were going to be away a long time. They’d arrive at Mars on August 9, 1982, stay there for almost three months, and then return to Earth for August 14, 1983: 640 days in all. In theory you wanted to minimize the weight of what you sent, but no margin for error meant nothing could go wrong without endangering the whole mission. 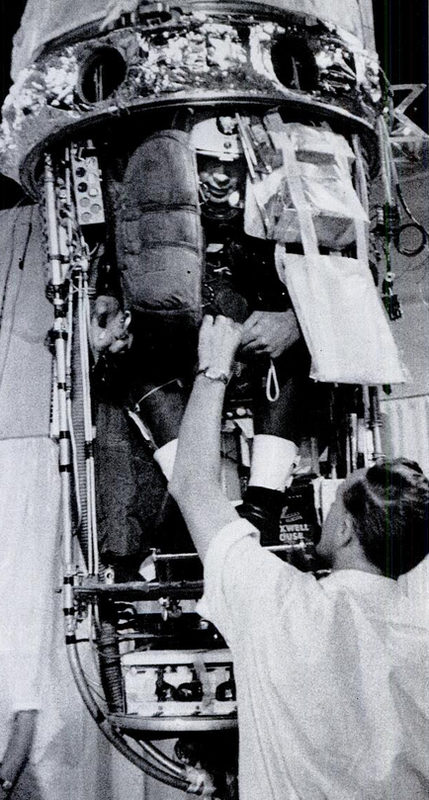 NASA had always operated on the principle that you needed something to work with in case of an emergency, a principle that would prove its worth a few months after von Braun’s presentation when one whole side blew off of Apollo 13’s CSM and the astronauts on board were able to ride the excess margins back to Earth. Away from Earth for far longer than any space mission flown to that point, the Mars expedition would get its margin by literally flying two missions at once. While at Mars six astronauts would stay aboard the PMM and Nuclear Shuttle combinations, flying in an elliptical orbit (a clever innovation by von Braun which made docking harder but cut the mass needed for the mission in half). After a remote sampler determined that it was safe to descend, six more astronauts would go to the surface in two groups of three aboard the Mars Expedition Modules, a capsule derived from the cone-shaped Apollo Command Module. They would slow down in what had only recently been discovered to be Mars’ very thin atmosphere by combination of a parachute, a ballute (a balloon-shaped inflatable parachute that works well at low atmospheric densities), and finally retrorockets starting three kilometers up. 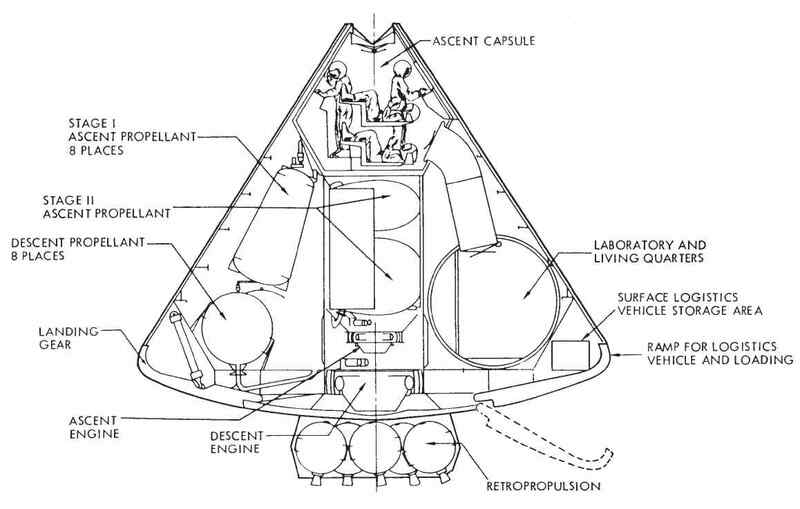 Cutaway view of a MEM lander. Public Domain image from NASA’s Humans to Mars: Fifty Years of Mission Planning, 1950-2000. Click for a larger view. 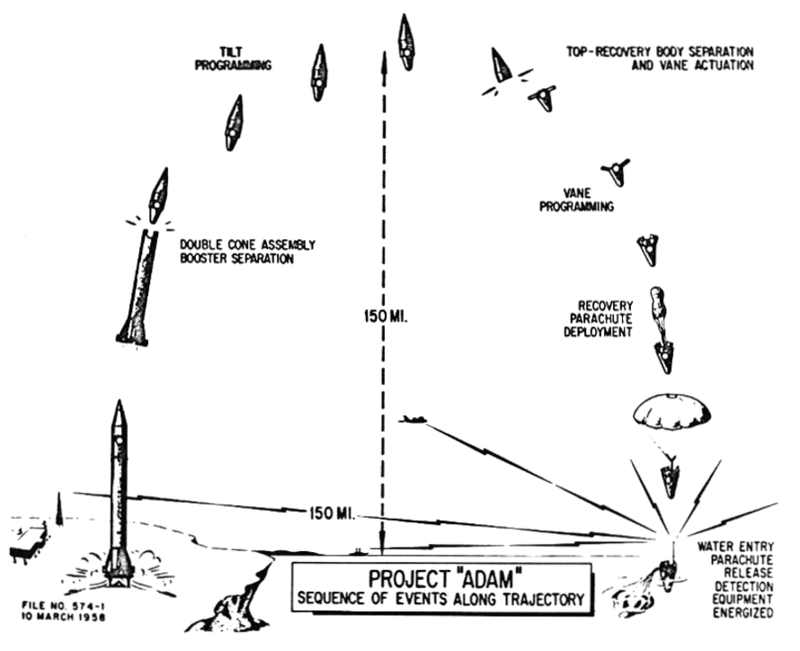 A MEM could support its crew on the ground for up to sixty days, then its upper stage could climb back into orbit for rendezvous with the PMMs and Nuclear Shuttles. The latter would then fire up one more time and start the long journey back to Earth on 28 October, 1982. The mission was not quite done, however. Their trajectory would take them back inside Earth’s orbit on a flyby of Venus on February 12, 1983. While this was a second opportunity for scientific study, it was primarily a speed-shedding maneuver. Four probes would be dropped on the way by. Having got the right trajectory and speed, the two Mars craft would pull into Earth orbit where they would dock with the space station (while not the Orbiting Quarantine Facility, which was proposed several years later, it would serve the same purpose). From there they would be picked up by the Space Shuttle for the last leg of the journey home. If for whatever reason the space station didn’t exist or wouldn’t be suitable for this, the mission could be designed instead with an Apollo-style command module would let the crew splashdown directly to Earth. Note that four of the Nuclear Shuttles had returned to LEO near the start of the mission; now the last two had done the same and so had their associated Mars craft. Only the MEMs would have been used up. Accordingly the ships would be refurbished and sent out again in 1986. Meanwhile, a second pair of ships would have been launched early in 1983, and on return be re-launched in 1988. By mid-1989, the intention was to have a 48-man semi-permanent base on Mars. Bearing in mind that the proposal was part of a larger manned space effort including the Space Shuttle and a Moon base, the total cost of NASA’s programs was estimated about US$7 billion per year through at 1976 and $8 to 10 billion for the few years after that. The Space Task Group accepted von Braun’s Mars proposal and the NASA Integrated Program Plan as a whole, and passed it on to President Nixon on September 15, 1969. What happened to make it fail: There was an utter disconnect between what NASA thought they should get in funding and what everyone else in the government was willing to give them. Even the Space Task Group was uneasy about the von Braun plan and offered two decompressed (and cheaper) versions of it—one where the Mars landing didn’t take place until 1986 and another where the landing was the goal but there was no set date for it. They still underestimated the opposition they would face. Mariner 7 flew by Mars the day after von Braun made his presentation to the Space Task Group, and appeared to back up what Mariners 4 and 6 had shown previously: that Mars was a dead world, cratered not overly different from the Moon. We now know that by bad luck these missions happened to photograph the most inhospitable parts of Mars rather than the (slightly) more Earth-like northern Hemisphere, but that realization was in the future. Initial jubilation over Apollo 11 faded within a few months in favour of hard questions about why men had to go to Mars in light of what had been learned. There was also a strong sense among the public and politicians that the United States had to get its house in order down on Earth. Protests against the Vietnam War were at their height and the country was still reeling from the urban riots of 1968. The Republicans had been voted back into power in the presidency in response (though the Democrats still controlled Congress) and Nixon was to continue the squeeze on the NASA budget that his Democratic predecessor had begun. When his director of the Office of Management and Budget Robert Mayo—an observer on the STG—objected to NASA’s proposal for FY 1971 coming in 29% over the cap he had imposed on them (US$4.5 billion instead of $3.5 billion) he convinced Nixon to put his foot down and NASA’s entire manned space program entered a death spiral. By the time the dust settled almost all of von Braun and NASA’s programs had been cut. On March 3, 1970 Nixon announced that he’d allow only a truncated Apollo program, one space station (Skylab) and a commitment to the Space Shuttle. NASA would try one more Mars proposal in 1971; Wernher von Braun left NASA in 1972 and died in 1977 even before his proposed mission would have launched. What was necessary for it to succeed: Almost everything was pointing against a Mars mission being approved in 1969. Public opinion was dubious (a Gallup poll in July 1969 found 53% of Americans against it—as Apollo 11 was going on! ), the political interest to explore space was fading away in the Democratic Party as John F. Kennedy receded into the past, and Nixon was struggling with paying for the Vietnam War just as the US economy was sliding into recession. After his presidency various inside sources reported that he had been looking for a way to wrap up Apollo without looking like “The Man Who Killed the Space Program”; ironically, the less-ambitious options included in the STG’s report gave him the loophole he needed to dive through. One possibility that could have brought about the mission would be a virtual tie in the space race, with the Americans and Russians getting to the Moon in a dead heat or possibly even the Russians getting a man on the Moon first. Under those circumstances the US might have committed to “Space Race, Round 2” and go for Mars. But this is a hard one to get flying, for all that it’s about the closest we’ve ever been to seeing a manned Mars mission. Even if it had been approved how much it would have had to shrink and delay as it rode out the 1973 Oil Crisis and the jittery economic conditions that lasted into the early 1980s is an open question. Some very nice renders of this mission can be found on the DeviantArt page of Drell-7, AKA Tom Peters. The Space Age came into focus during the mid-1950s as it became more and more well-known that a ballistic missile could reach orbit. In the United States this can be pinned on a series of articles published in Collier’s magazine from 1952 to 1954 under the general title “Man Will Conquer Space Soon!” With the aid of Willy Ley, Fred Whipple, Heinz Haber and journalist Cornelius Ryan, Wernher von Braun presented his vision of space exploration to the American public. While there wasn’t an enormous amount of official interest in United States space exploration, the concept seeped into the American consciousness just in time for the International Geophysical Year (IGY). In 1952 the International Council of Scientific Unions called for a worldwide push of geophysical research from July 31, 1957 to December 31, 1958. The death of Stalin in 1953 led to a mild thaw in the Cold War and the possibility of some scientific cooperation between the capitalist West and the USSR and its clients, and the IGY was a great success. As part of the lead-up to the IGY, the United States announced Project Vanguard, which was to launch a satellite some time before the end of 1958. The US Army, Navy, and Air Force—all of which were developing rockets for their own use—each tried to snag this plum and its associated funding. The Air Force had little to offer as their Atlas rocket was still in relatively early development: it would not make its first orbital launch until December 1958, and even that was only possible because of a massive increase in funding and personnel during the “missile gap” that couldn’t have been foreseen at the time. The Army and Navy each made their cases more plausibly. Wernher von Braun’s Hunstville team proposed modifying a Redstone nuclear missile into the Jupiter C as a launcher. It was quite close to completion but suffered from two political problems: it had been designed primarily by German engineers, many of them former Nazis, and it was derived from a weapon at a time when the US was interested in establishing space exploration as a peaceful endeavor. If nothing else, President Dwight Eisenhower wasn’t interested in potentially ratcheting up tensions with the Soviet Union by launching what could be reasonably seen as a nuclear missile; his balancing of the American budget depended on military cuts. Meanwhile the Navy had worked with Glenn L. Martin (later part of Martin Marietta, in turn now part of Lockheed Martin) to develop the successful Viking sounding rocket and proposed extending it with another two smaller upper stages so it could act as an orbital launcher. While less far along than the Redstone, it contrasted favorably for political purposes: it had been developed primarily for scientific research and by American engineers. In the absence of any great time pressure, the choice was obvious. The Navy proposal was selected, and their prospective rocket named Vanguard. Von Braun didn’t take this lying down and engaged in a stealth campaign to give his Huntsville team the laurels he’d long chased. On September 20, 1956 they test-launched a four-stage version of the Jupiter C that was quite capable of putting a satellite into orbit. Unfortunately for him the powers-that-be were quite aware of his dissatisfaction and watched the launch preparations to the point that there was an observer on site to ensure that the final stage of the rocket was unfuelled and loaded with sand. Von Braun was not going to be allowed to launch anything into orbit “accidentally on purpose”. This attitude changed radically on October 4, 1957, where to the shock of the world the United States was beaten to space by the Soviet Union. 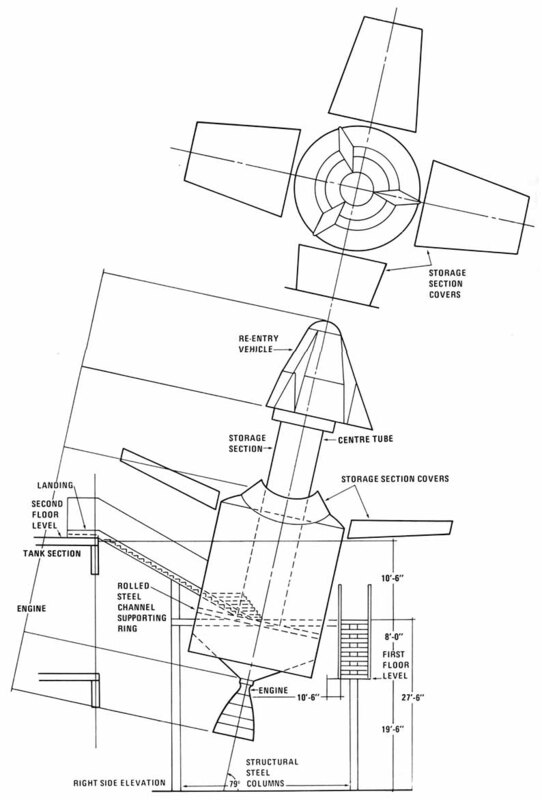 Using an R-7 nuclear missile as a launcher, examples of which had been launched successfully twice before in August and September, the USSR put Sputnik 1 into space. Von Braun was furious and soon announced that, if asked, he could put an American satellite into space within 60 days. American governmental officials were sanguine, though, even congratulatory and let Vanguard continue. Political pressure mounted as a second Sputnik (this one carrying the dog Laika) was orbited in November and then December’s attempt at launching the Vanguard satellite exploded two seconds after launch. The United States made it into space on February 1, 1958, when the Huntsville team and the Jupiter C were given their chance and they launched the IGY satellite Explorer 1. Both the Americans and Russians then moved forward on a manned space program, starting with the one-man Vostok launching on an R-7 for the former, and the one-man Mercury capsule on top of the Mercury Redstone that was derived from the Jupiter C for the latter. Though the Mercury was smaller than the Vostok (1355 kilograms compared to 4726 kilograms) and less-capable (Vostok could stay in orbit for a week, while a Mercury astronaut had to return after a day at most), the Russians once again beat the American effort by placing Yuri Gagarin in Earth orbit on April 12, 1961. The Americans made two suborbital Mercury flights, which did nevertheless qualify as “Men in Space” by clearing 100 kilometers in height, before placing John Glenn in orbit on February 20, 1962. Both programs then focused on multi-astronaut spacecraft, with the Russians launching a variant of the Vostok, the Voskhod (once again on an R-7) with first three men then two. After Glenn the Americans stepped up development of the three-man Apollo they had begun working on as early as 1959 then, realizing that there would be several years before it was ready which could be used to explore orbital docking and maneuvering, developed the two-man Gemini capsule for the interim. The Saturn I and V, derived from the Jupiter C, were created at the same time to be used as launchers for Apollo. The three-man Voskhod 1 launched on October 13, 1964 and Voskhod 2 chalked up the first spacewalk on March 18, 1965. The first multi-man American trip, Gemini 3, was overshadowed when it took off five days later, while a spacewalk didn’t follow until Gemini 4 in June. But despite the Russians apparently continuing their lead in the space race, for all intents and purposes they were done. The Russians were still using essentially the same equipment they had used to launch Sputnik and Gagarin and anything new was still a ways down the pipeline. Tellingly, the first manned Gemini had gone up on a Titan, a new launcher from the Air Force. The transition was punctuated by the death of Sergei Korolev on January 14, 1966. Until his funeral his name was essentially unknown, partly so that the successes of the Russian space program could be credited to the State as a whole and partly out of fear that he might be assassinated. Cryptically referred to as “Chief Designer” instead, Korolev was the USSR’s counterpart to Wernher von Braun, having headed the programs to design the R-7 as well as the Vostok and Voskhod capsules. He had even directly intervened to start a crash project that built Sputnik 1 when it became apparent that the initially intended Object D (which would eventually become Sputnik 3) was not going to be ready in time. With his death the Soviet space program passed on to his lieutenant Vasily Mishin, who would prove to be incompetent. From then on the Americans began scoring firsts. In 1965 and 1966 they achieved the first-ever rendezvous between two spacecraft (Gemini 6 and 7), the longest flight (14 days, with Gemini 7), the first docking between two spacecraft (Gemini 8). The USSR’s main highlight in the late 1960s was the development of the Soyuz capsule, which as of December 2011 is still in use and is the most reliable and successful spacecraft in history, numbering 112 manned launches. Unfortunately political pressure made its first use necessary before it was ready and the Russians chalked up a dubious first—the first death on a spaceflight as Vladimir Komarov died on April 24 1967 in the crash landing of Soyuz 1 after a mission in which his spacecraft repeatedly malfunctioned around him. The United States had had their own tragedy a few months earlier, when a fire during the testing of an Apollo capsule on the ground killed three astronauts. The never-flown mission retroactively named Apollo 1, their deaths would keep another Apollo from flying with a crew on-board until October 11, 1968. But from then on it was smooth sailing for the Americans as the next mission, Apollo 8, launched on December 21, 1968 and memorably had its crew greet the Earth on Christmas Day from their position in lunar orbit. Two more tests (including Apollo 10, which descended to with 10 kilometers of the moon’s surface as a final dress rehearsal for the next mission) led up to the end of this era of manned spaceflight. In arguably the single most famous event of the 20th century, Apollo 11 took three people to the moon, with Neil Armstrong becoming the first person to walk on its surface on July 21 1969. The Soviet government claimed for decades afterward that they had never had any intention of sending men to the moon, though they twice launched an unmanned probe that would return a lunar rock sample in the period just before Apollo 11 in an attempt to upstage the American accomplishment (both failed). Since the collapse of the USSR and the opening of their archives it’s become clear that this was far from the case, as we shall see.